We are living a life in which stress is the part of everyone life, it doesn’t matter if you are a school going student, teenager, housewife, or working woman. Stress can harm our body in many ways and hair loss is not an exception to it. Stress is directly related to hair loss, the more you worry the more you lose your hair. Everyone loves their hair but some people are having fear of hair fall and this fear give the kick start to your hair fall. The tension of hair lass provokes the hair loss. Everyone is having their own tensions and there is no way to hide from it but there are many ways to fight with it. It is a universal truth that stress provokes hair loss, there is no debate about it. Hair loss can be temporary or permanent. 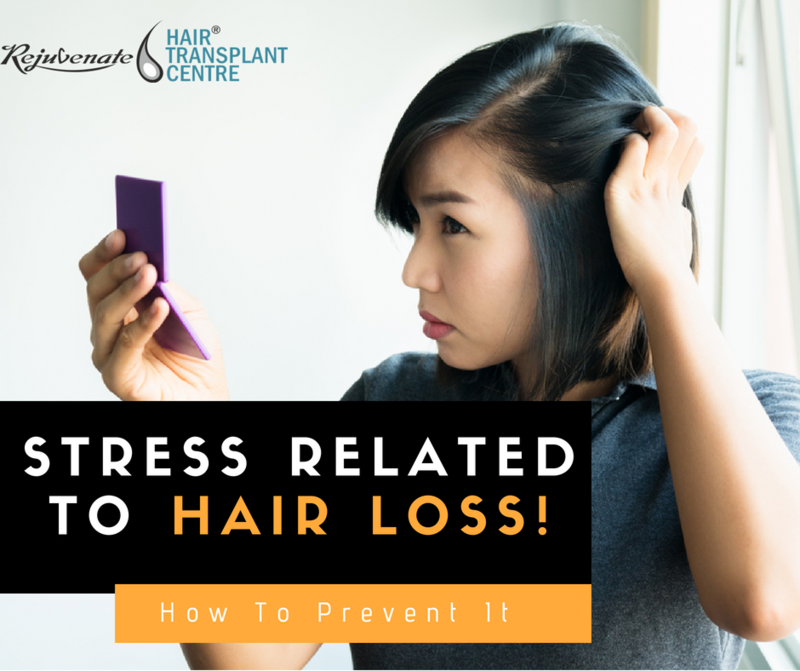 If you are going through in a very stressful condition from six weeks to three months due to break-up, poor diet, divorce, illness, death, financial tensions, or any other reason which may cause hormonal changes, your hair may start fall. Once you realize that you are having a hair fall issue, your stress level increased and this is will make the condition worse. 1. Telogen Effluvium – Telogen Effluvium is also known as temporary hair loss condition. It occurs due to a shedding of telogen (resting). Why a temporary hair loss occurs? The main reason of it is trauma or shock which leads to temporally hair loss. Once we are in the condition of emotional or physical stress, normal hair cycle starts changing and it may lead to fall of hair in an early stage. As the name denotes it is a temporary one, so new hairs will grow continuously. The identity of telogen hair is its bulb or club-shaped tip. 2. Alopecia Areata – In general term, we can call it Spot Baldness. In this condition, hair is lost from particular areas of the body and sometimes all area of the body or scalps. When we see a coin-shaped bald spot or patches in hair scalp then we can confirm it with Alopecia Areata. It is a systemic autoimmune disorder. Autoimmune denotes body attacks its own anagen hair follicles and stops hair growth from that area. Sometimes it can be genetic as well. diffuse alopecia areata – Hair lost diffusively over the whole scalp. Alopecia areata monoculars – It may occur anywhere in the head in the spot from. Alopecia areata multilocularis – Multiple spots of hair loss. Ophiasis – In this hair loss is occurred in the head circumference in a wave shape. Alopecia areata barbae – In this only beard is affected. Alopecia areata totalis – In this condition, all hair of the scalp are lost. Alopecia areata Universalis – In this, all body hair are lost even the pubic hair. 3. Trichotillomania – This is a very rare and weird condition. In this condition, the affected person pull their own hair due to stress or anxiety. That is why it is known as self-induced and recurrent loss of hair. This condition come under obsessive-compulsive disorder (OCD). It can be confirmed with the loss of hair from one or two sites of the of the scalp hair but sometimes it may be seen in multiple sites as well. The causes are severe stress or anxiety, OCD, depression. How one can prevent hair loss? Little and regular steps can prevent hair loss. Proper Diet: Diets with full of important nutrition’s like vitamin B6 and B12, Iron, Zinc starts regrowth of hair fast. Taking Care of Hair: If, you are facing hair loss condition please avoid blow drying, hair color, curling, or straightening of hair until. Exercise: It helps to prevent stress and makes you feel happy and good about yourself. Once you have a stress free lifestyle you can feel the difference in hair growth. Meditation: Meditation is one of the best way to prevent yourself from negative thoughts and keep your mind calm. Meditation shows a positive impact to prevent hair loss.